Renger van der Zande and Marc Goossens give the Visit Florida Racing the first victory this season in the IMSA WeatherTech SportsCar Championship by winning the America’s Tire 250 at Mazda Raceway Laguna Seca in Monterey, California. It was an emotional win for the team from Daytona Beach, Florida, which survived a tough time during the Hurricane Irma just 14 days ago. Their #90 Ligier JSP217-Gibson LMP2 prototype won the race ahead of DPi prototypes, making it the first win for the LMP2 prototype this season. A decisive moment happened with three laps remaining when Renger van der Zande made a pass in the infamous Corkscrew corner, taking over the lead from Dane Cameron in the #31 Whelen Engineering Cadillac DPi-V.R. 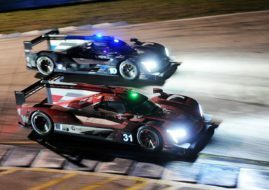 The second-place finish of Cameron and his co-driver Eric Curran was enough to promote them to the second place in the series standings ahead of season’s finale, the 10-hour Petit Le Mans on October 7. Championship leaders Ricky and Jordan Taylor have 29-point advantage. The brothers in the #10 Konica Minolta Cadillac DPi-V.R. finished third at Laguna Seca. John Edwards and Martin Tomczyk won the GTLM class in the #24 Team RLL BMW M6 GTLM despite Edwards’ spin on the opening lap and a drop to 33rd place. After two hours and 40 minutes of racing, they were in front of all GTLM crews. At the finish line, Edwards beat Toni Vilander in the #62 Risi Competizione Ferrati 488 GTE by 0.152 seconds. Vilander was sharing a car with Giancarlo Fisichella. Third place in GTLM went to Patrick Pilet and Dirk Werner in the #911 Porsche 911 RSR. Jan Magnussen and Garcia finished fourth in the #3 Corvette, retaining their points lead ahead of Petit Le Mans. The yhave 19 points more than Ford’s Ryan Briscoe and Richard Westbrook, who finished fifth at Laguna Seca. Christina Nielsen and Alessandro Balzan are the leaders of the GTD class but they needed eleven races to score their first win of the season. Finally, at Laguna Seca, the #63 Scuderia Corsa Ferrari 488 GT3 took the checkered flag as winning car, beating the #93 Michael Shank Racing with Curb-Agajanian Acura NSX GT3, shared by Andy Lally and Katherine Legge. Patrick Lindsey and Joerg Bergmeister rounded out the podium in the #73 Park Place Motorsports Porsche 911 GT3 R.
Nielsen and Balzan extend their championship lead to 26 points over Jeroen Bleekemolen, who finished eighth together with Ben Keating in the #33 Riley Motorsports-Team AMG Mercedes-AMG GT3.